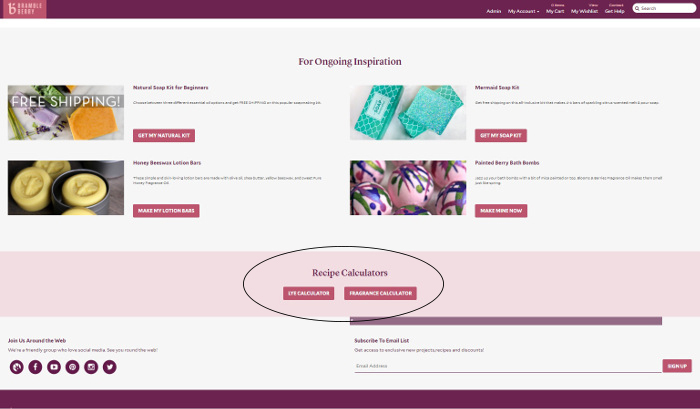 This post was updated in 2017 with the new Bramble Berry Fragrance Calculator design. 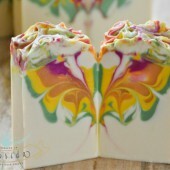 Have you ever started to make a batch of soap and realized you didn’t know how much fragrance or essential oil to use? Trying to figure out how much scent to add used to be a bit of an experimental process, and it didn’t always turn out so well. It’s frustrating to add too much of an expensive essential oil or not enough fragrance oil and end up with a beautiful but unscented bar of soap. Knowing how much to add can save you both time and money. 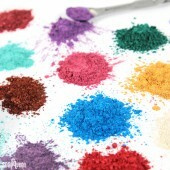 One of the best features on the Bramble Berry site is the Fragrance Calculator. It’s a handy tool that takes the guesswork out of soaping and gives you complete control over your recipes. Read on to learn how to make the Fragrance Calculator work for you. 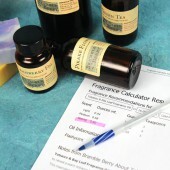 ONE: Find the Bramble Berry Fragrance Calculator here. You can also find it near the bottom of the website in the pink area pictured. 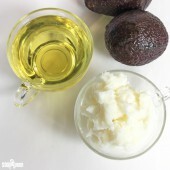 The calculator has options for lotion, liquid soap, cold process soap, melt and pour soap, salts and scrubs, rebatch soap, candles, and shampoo and conditioner. 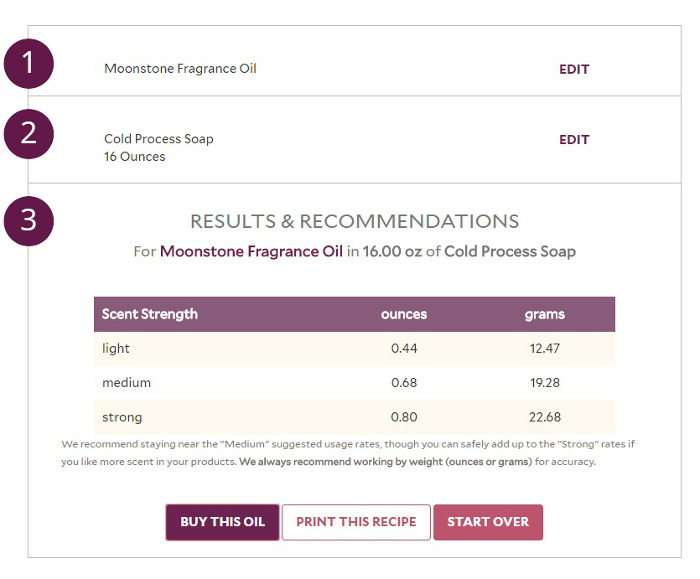 TWO: Start by typing in the fragrance you’re using and then click “Next.” In this example we’re using Moonstone Fragrance Oil. 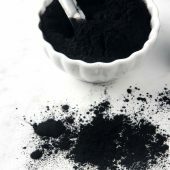 FOUR: The results section gives you the recommendations for a light, medium, or strong scent in ounces and grams. You can change the scent, project, or weight by clicking the “Edit” buttons next to them. At the bottom there are options to buy the oil, print the recipe, or start over. Finding out how much fragrance or essential oil you need is really that simple. 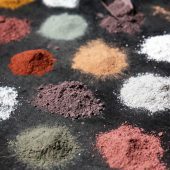 You can also use the calculator to create custom blends – this post talks about how to blend fragrance oils, and this post talks about how to blend essential oils. You can also follow the general recommended amounts for various products below. They are medium strength. Some fragrance and essential oils are light or exceedingly strong in soap, so you can always use a little more or a little less to your preference. For instance, English Rose Fragrance Oil is very strong, so you don’t need to use a full 0.7 ounces per pound of soap to get a strong scent. Always adjust to your personal nose and fragrance preference. New at using fragrance oils an I am curious is there a actual calculator for each oil or just a mild to strong scent .. according to what you decide to use ? 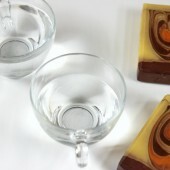 Our soap molds are pretty much 20 bar sets Hot process total batch weight 6.5 pounds. With our essential oil our usual measurements per 4.5 oz bar was 1/4 to 1/2 teaspoon per bar. Would the fragrance oils be much different? 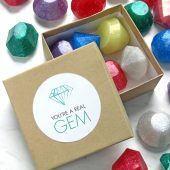 It will ask you what fragrance you’re using, what product you’re making and how large of a batch. It will then give you the usage rates for that product with a Low, Medium and Strong suggestion. We normally recommend measuring by weight though for the most exact results. 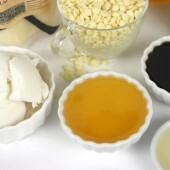 The amount used will depend on the specific essential / fragrance oil being used. Since the fragrance calculator uses a total of oil+lye+water that weight can differ depending on how the water amount is calculated. 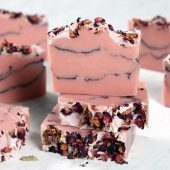 Can you explain how Brambleberry calculates the liquid amount for cold process soap that was used for setting the fragrance? Is the amount of liquid that you use in your lye calculator the amount you use in your fragrance calculator? The amount of liquid our lye calculator goes out to is 22%. The fragrance calculator scents the whole batch since during a typical cure period each bar loses less than a half ounce of water weight per bar. Thank you so much for your response to the ratio of fragrance to soap base. I make primarily cp goat milk soap, and am curious how calculations work when blending fragrance oils to create a new scent. I have successfully made several blends, but definitely do not want to risk using too much fragrance in the name of making sure both scents are evident after curing. I’m wondering how much fragrance oil to add to an oil based perfume. I previously used your solid perfume base with the suggested ratio of .25 oz fragrance to 1 oz base, but this always seemed very high to me. Would it be the same? What would you suggest? I am trying to find the IFRA Guidelines for each fragrance oil you sell. How do I find that information? We can provide documents for fragrance oils you’ve ordered. You can request that by emailing [email protected]. You’re welcome, thanks for reading Dee. I am unclear as to how much fragrance to use in my bath bombs, bubble bars etc. and want to make sure I am staying within the safety margin. For instance, If I am making 2 – 100 gram bath bombs in the pumpkin spice fragrance, for a strong scent, I can add 0.21 ounces according to the calculator, which would be 0.1 ounces each. But what if I decide to only make 1 bathbomb instead? Now the amount in the bath is 0.21 ounces. My point is how much of the fragrance is actually safe to add to the bath because it’s going to be different depending on the size of the finished product. Thank you so much and I love all of the information and support you provide!! You can add that fragrance depending on how much your total batch weighs. 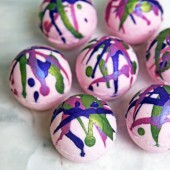 So, if you have just one bath bomb, add the .2 oz. 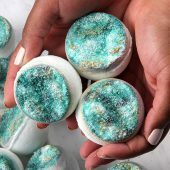 The good news with bath bombs is the fragrances are diluted in a large tub of water, so you can use the strong recommendation without any worry. Good to hear as some fragrances are very light. Thank you Kelsey!! Hi there! 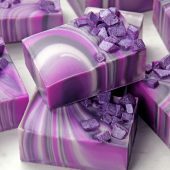 I’m a very new soap maker and wanted to try making my own recipes. I tried a few combinations in the Lye Calculator. I was just wondering — do fragrance oils and essential oils need to factor into the Lye calculations? Or do I just use the base oils to calculate the lye/liquid needed? Fragrance and essential oils are considered additives, so you don’t need to factor them into your lye calculations. Once you have the total weight of your soap (lye, water, and oils), plug that into the Fragrance Calculator to find out how much to add. it’s not just about the amount of fragrance folks. don’t forget to mention the temperatures! I soaped at about 100 degrees and got a smell that at times goes from something I can’t even describe ( not bad but not good either) to almost nothing. wasted about $20 in materials. only been two days since I made it. still has the ricey bumps on it. same recipe using menthol and peppermint well behaved. Apricot Freesia did not. I kept in my mind a little higher temp and I’ll be able to swirl with some color…once it began to rice up into an oily mess the color just blended into one. maybe a reminder on the bottle to the soaper? May rice over 100, use no more than 1.5 ounces pp, etc. kind of like side effects for medicine? just a thought. We’ll get the note about high temperatures causing Apricot Freesia to morph on the label. Thanks for your suggestion Diana. 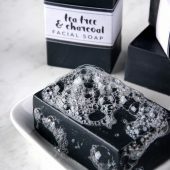 Thanks for clarifying that for CP soap, the fragrance calculator is intended to be used considering the final weight of all ingredients, including lye water. However, depending on one’s water discount, this weight will vary for the same amount of oils. Further, once CP soap cures, some water evaporates. For example, I have one recipe that yields 1,250 grams of batter, but the finished soap weighs 1,000 grams after 6 weeks of curing. So, should I calculate the fragrance amount based on 1,250 grams or 1,000? It would seem that the FO isn’t going to evaporate with the water that’s lost during curing, but maybe it does? …. . If the FO is calculated based on the batter amount, rather than the final soap weight, could you end up exceeding the safe usage rate? (i.e., higher than a safe percentage in the final product). If you know the weight of your soap after curing, you can plug that number in. Our Fragrance Calculator is formulated on the safe side, so even though you lose weight during the cure the fragrance amount shouldn’t be enough to cause irritation. 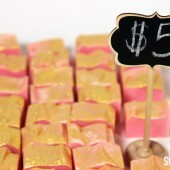 Hello, I’m really interested in making homemade soap, and possibly others like oils, bath bombs, etc (But that’s future talk).. I have so many questions, but the one that has been annoying me is.. 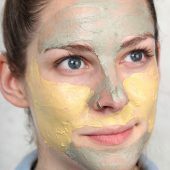 If I add essential oils to my soap, do/can I add fragrance as well? Or will the essential oil be enough fragrance on its own? If so, do you have any recommendations/good combinations? You can add just essential oil to your soap, just fragrance oil or a combination of both. Some of my favorite combinations are essential and fragrance oil, including 10x Orange Essential Oil and Vanilla Select Fragrance Oil. It smells like a creamsicle! I am new to soap making. And the fragrance calculator is great. but…..what about soap recipes that ask for things like bentonite clay and colloidal oatmeal? 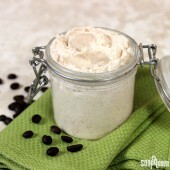 I am making a shaving soap recipe and that are some of the ingredients. Any help would be great! I’m glad you find the fragrance oil calculator helpful :). 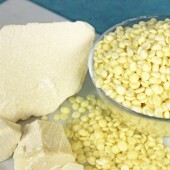 Ingredients such as bentonite clay and colloidal oatmeal are awesome additives in soap. 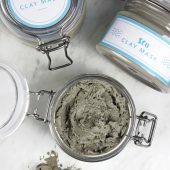 Clays in general add properties such as oil absorbtion and “slip,” while colloidal oatmeal is soothing. 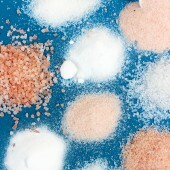 These ingredients are often referred to as “additives,” and there are no rules as to how much you can use in your soap. It really just depends on personal preference! 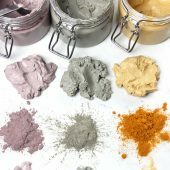 When working with clays, one thing to keep in mind is that clays absorb moisture. In soap, this can lead to it drying out and cracking. To help combat this, we recommend dispersing them in water (rather than oil) before adding them to cold process soap. Below are a few blog posts that you might find helpful! Colloidal oatmeal is an extremely fine ground oatmeal that is not rough or abrasive. You can use it up to 5% in cold process soap. I would recommend dispersing it in a lightweight liquid oil before adding it to soap, to help avoid clumps. I recommend using 1 tablespoon oil per teaspoon of colloidal oil. You can see this in the Goat Milk & Oatmeal Cold Process Soap Tutorial below. I hope this helps Lucy! 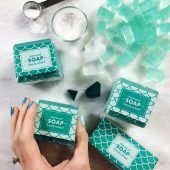 Directions are non-existent in this blog on how to determine the number of ounces of soap I am making in order to enter the amount into the fragrance calculator. Is the number of ounces determined solely by the total ounces of oil used OR does it also include the number of ounces of water and lye? Thanks. Thanks, Kelsey! I appreciate the information. Hi there! I was just wondering for liquid soap do I put in the weight of soap paste, or for the diluted soap amount? Any suggestions would be very helpful!! Thanks! The weight of your final diluted soap! I am pretty new to soap making. I used extra peppermint in hot process soap. 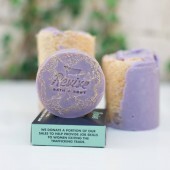 Although soap is excellent in quality and lather, I would still want to tame its overpowering scent. How can I save that batch? Please help. 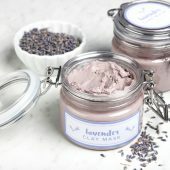 Can I make similar unscented batch, and add this particular batch with peppermint? 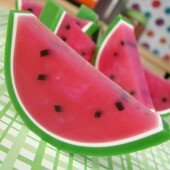 Will that yield similar quality soap? I think you have a great idea. 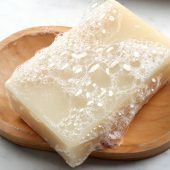 I would recommend rebatching the soap and adding equal parts of unscented soap. 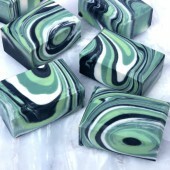 Adding that unscented soap should help tame the peppermint. Also, the soap will feel great! If I am using 2 oils together such as lavender and tea tree, and I want a strong scent of both, do you recommend the full amount the calculator suggests of both or halfing the fragrances? Thanks for your suggestion, I passed it along to our website manager. 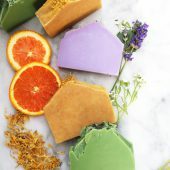 I am making shampoo bars and adding 3 different essential oils for their particular value and think it would be great to have a fragrance calculator that would take this into account. I had to sort thru a lot of questions to find one that addressed this issue. Our Fragrance Calculator is the recommendation per pound of soap. That includes oil, liquid and lye. Also, you can use the “Cold Process” option from the drop down menu for hot process soap. Can you add solid perfume as a category to the calculator? I’m wondering about how much Black Amber to add to 2 oz of solid perfume. I watched your video where you talk about using fo’s, but then you only give the measurements for eo’s. Thanks! Good one! You can’t print your recipe from an iPad or an iPhone. So frustrating to have to dig your computer out just print. You can access the calculator on the BrambleBerry.com mobile site, it’s located near the bottom of the page. That makes it easy to use on the go. Hi again! 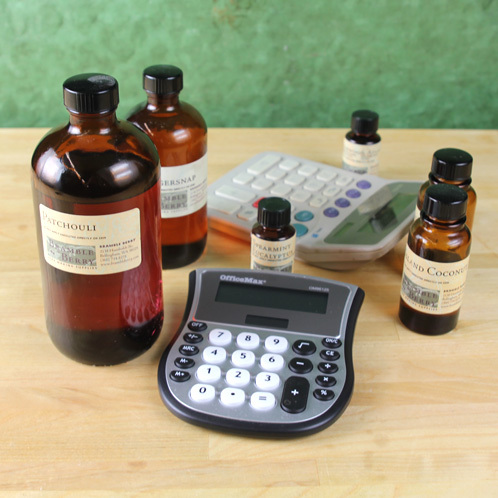 Just a simple question that I may have missed, when you are using the fragrance calculator (or when calculating for a mold), do you include the lye and water or just the oils? Maybe a silly question but oh well! Seems like you would but just want to be sure. I think Ive been over scenting so I’m paying more attention now. Thanks! Hi there. Thanks for the great info. I am starting my soap journey so this was very helpful. 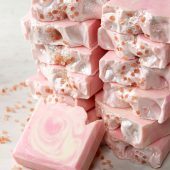 If it is the first time I’m doing a recipe, how do I know how much my soap will weigh to enter that into the calculator? Is there a way to estimate this based on the recipe? You’re welcome, so glad you found the post helpful! When you’re making your soap, we recommend measuring everything by weight. We’ve found it’s more accurate, and that way you know the correct weight for the Fragrance Calculator. Purchased Fir Needle and Rosemary fragrance oils from Brambleberry but they’re not listed in the calculator. I’ll follow the above info at .7oz per lb. Thanks. Be great if they were added to the calculator. 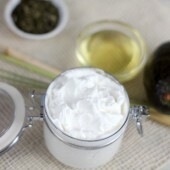 When creating your own lotion recipe, do you include the fragrance as part of the total percentage or after? For example would the 20 oz include the fragrance or would the fragrance be added on top of the 20 oz of oils, butters, water, etc. Also same question for preservative? 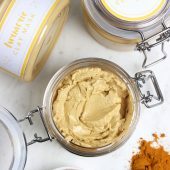 So both the preservative and the fragrance are additives are are done after the fact based on the Oils, Butters, Waxes? Whoops, looks like I missed the question about preservatives! Sorry about that Helga. Since I’m fairly new to soap making I purchased the Honeysuckle, and didn’t realize it was a FO and not an EO. I’m allergic to the smell of most synthetics but I thought I’d try it anyway. It turns out I’m allergic to it, not to mention it didn’t go well with the oil blend I used (which consisted of some bear tallow). Instead of throwing out my entire batch of soap, if I rebatch it, will it burn off some of the FO? Then I might be able to give it away. Oh no, I’m sorry to hear that! The Heavenly Honeysuckle and Honeysuckle Surplus fragrance oils both have flashpoints of 200F or higher. 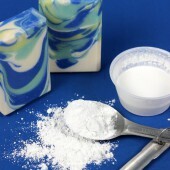 If your rebatch gets that hot, it will burn the soap and could make it dry or crumbly. I’ll definitely pass that along to the person in charge of the Fragrance Calculator, thanks so much for letting us know! Here is my question. 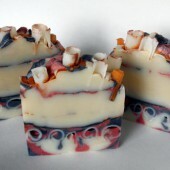 Can I mix eo’s and fo’s in the same batch of soap? Also in your chart that tells how many oz’s to use for each type of soap, I didnt see hot process soap listed. You can absolutely mix fragrance and essential oils! I just saw Cathy’s question too. But how do you calculate ratios when using more than one EO? How much of each essential oil you use is up to you. For instance, if you like a stronger citrus smell, you can add more citrus. It may take a little blending to get the scent you like! But what if I’m using more than one EO in my soap. How should I calculate that? I really appreciate all of your experimenting and informing us of good usage rates. It saves being frustrated and wasting soap! I have been distilling Lemon Verbena essential oil, and with my table top distiller it takes some time to get a quantity of oil from the dried leaves. I have about 2 mil right now. This seems like a strong eo. 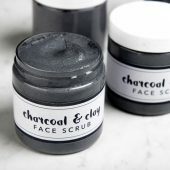 Do you have any experience with using it in CP soap? It is edible and on the skin it seems very strong. I was wondering if I will be using 44ozs of oils and the recipe is 1 part orange essential oil, 1 part patchouli essential oil & 2 parts lavender essential oil how do you put this into the fragrance calculator? 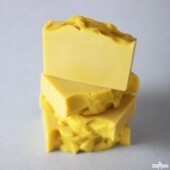 I would then use the general usage rate of .7 ounces of fragrance oils per pound of soap. For example, if your yield was 64 ounces (or 4 pounds) you would use a total of 2.8 (.7 ounces multiplied by 4) ounces of fragrance. Then, you just need to figure out the ratios, which would be .7 ounces of orange essential oil, .7 ounces of patchouli essential oil, and 1.4 ounces of lavender essential oil. Is the ‘0.7 ounces per pound’ usage rate for CP soap the total weight of everything (oils, water, lye, butter, etc) or is it the total weight of just the oils? This was my first time using the fragrance calculator. I used the strong suggestion for the “coconut cybilla” and the result was a soap almost “unscented”. Fortunately for me, I always make a test batch (414gms) before making the regular one. In my notes I wrote…next time more scent as is almost unscented. I used vanilla stabilizer (from Brambleberry) with the scent and the finished color is a light salmon, not bad look nice… but I tough it will be more clear, at least a beige color not a salmon color. I added the same amount of stabilizer than fragrance oil. What happened here? I used the vanilla stabilizer with “Vanilla Select”in the past and the soap color was a light beige. 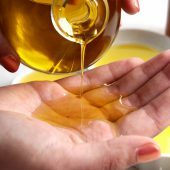 I just wanted to “2cd” the suggestion for a quick reference guide on your essential / fragrance oils, perhaps as a download, PDF file that could be printed out by those of us, who are new to soap-making. I have used your fragrance calculator (&, yes, it is really fantastic & much appreciated), but I still added too much & ended up w/a small amount of ricing in one of my colors. I use my iPad when soaping, & just did not read it correctly, (think soaping goggles on, readers off…). If this is something Brambleberry would consider offering, even as an incentive for ordering a certain $$ amount of fragrance oils, that would be fantastic! 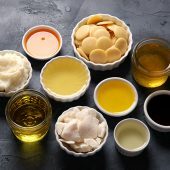 Just one other idea that I would find extremely helpful with a fragrance oil reference PDF, would be the added perk of popular/ timed tested fragrance oil blends, which are offered throughout the descriptions of the FO’s offered by BB. I love being able to read those FO blends, but can never retain all that info when really needed. I’d like to see a couple of EOs added – Karma & cinnamon. I am a new soapmaker and getting used to the weighing the liquids soI want to clarify before I place my first order. 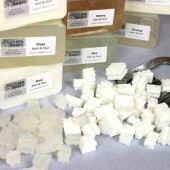 If I am making a 5# batch of cold process soap I need 3.60 oz. or about 7 tablespoons of the Relaxing fragrance oil blend. The bottle of oil is sold by the oz, which correct me if I am wrong is a liquid oz. measurement, so I should need a little more than the 4 oz bottle. 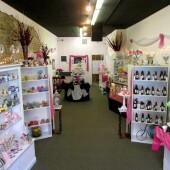 All of our fragrances are poured to order by weight, which means you’ll receive 4 oz (by weight) of fragrances. Because some oils are heavier than others, sometimes this means that the bottle will not be filled up all the way. So while the fragrance may be 3.6 oz, it may not be 7 tablespoons. 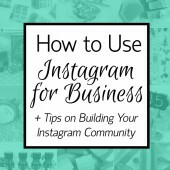 To give you a better idea of what I mean, you may find this post helpful! 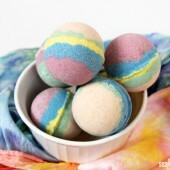 If you want to figure out the amount for bath fizzies, does that fall under salts, or something else? Also, I’m wondering about Orange Valencia? Yes, that would fall under salts and scrubs 🙂 .3 ounces of essential oil per pound is a good amount for bath fizzies. The Orange Valencia Essential Oil is a very light and fresh scent that works great in cold process as well as other body products. I bet it would be great in a bath fizzy! 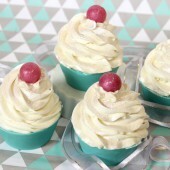 Here are some bath fizzy recipes to get you started! 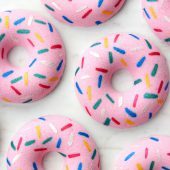 Potentially stupid question (so I will start off by saying I’m only in week 1 of my soaping adventures!) but if I am supposed to use .7oz per pound of cp soap then that would be 1.61oz of EO/FO for a 37oz batch but most EO/FO that I’ve found come in a 10ml bottle so I would need to use 4.5 bottles to use the recommended amount? I thought 37oz was a rather small batch size (while I’m testing out recipes) but 4.5 bottles of scent seems quite a lot? Just curious if I’m misunderstanding? 🙂 Thanks!! 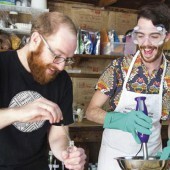 Welcome to the soapmaking world! We are so excited that you have started soaping and can’t wait to see how your batches turn out. If you do not purchase your essential and fragrance oils at Bramble Berry, they may come in smaller bottles, but if you purchase them with us, you can typically get any fragrance oil in a 2, 4 and 8 ounce size. 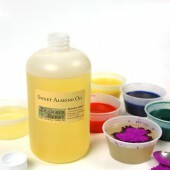 If you are only using 10 mL bottles, you will need quite a few to get the full amount for your soap batch. 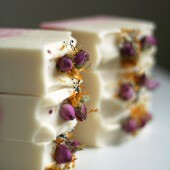 The typical usage rate for fragrances in cold process soaps is .7 ounce per pound. 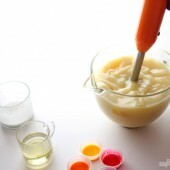 This will ensure that your entire batch (lye + water + oils/butters) get scented. 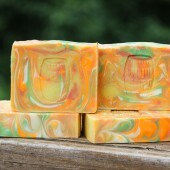 37 ounces is actually 3 lbs of soap and would use about 2.1 ounces of fragrance oil for the entire batch. Thanks so much. And your videos are AMAZING btw! Love watching them and love that you stick the bloopers in! I use Optiphen in my Conditioners, at 1%. I can still smell it if it’s Unscented. But once you scent it the smell goes away. Is this what you recommend ? Oops silly me! I see, it’s the FO and EO’s are different. Sorry!! I love the calculator! It is a great tool, but like you said you have to trust you nose, and personal experience too! I just want to clarify, in the ver first list in this article, shampoos and conditioners are listed twice, once at .4, and then .2 oz per lb. later it’s listed at .4. So is it.4? I have to go with customers personal preference most of the time on hair products. But you have to use enough to cover the preservative smell. Does anyone else notice that? I can smell it, and I don’t like it, but FO or EO’s cover it up. There are two different usage rates listed above, one for essential oils and one for fragrances oils. 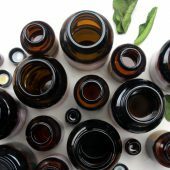 Because essential oils are so potent, you are going to generally use less of them in your products than you would the fragrance oils. We haven’t had a problem with the preservatives smelling too much in hair-care products. Which ones are you using? Thank you so much for this calculator. 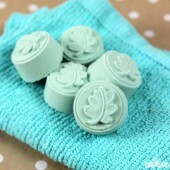 I’m a small soaper so I might only make two or three soaps with one fragrance and Yeah! I know now how much to use. (I was using way to less) I do have one question, if one of the fragrance oil has vanilla in it can I use the stabilizer so it doesn’t turn brown? 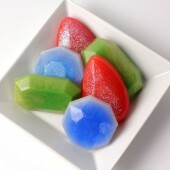 If you are making melt and pour soap, you can use Vanilla Color Stabilizer to help prevent your soaps from discoloring. 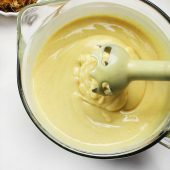 Vanilla Color Stabilizer only works marginally well in cold process (for 4-9 months), so I would try a tester if you are making a CP recipe. But this recomendation of 0.6 ounces per pound of liquid soap is intended for diluted or undiluted liquid soap? 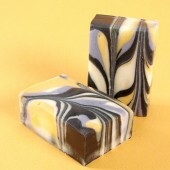 Your fragrance calculator is based on weight of the finished soap, correct? Since I am used to figuring things out using the weight of my base oils, I just need to clarify. Should I add up the weights of all the ingredients (oils, lye, water, milks, additive, colorants, and the fragrance/essential oils) to find the weight of each batch? Thanks. Glad this question was asked, I was wondering the same thing. Could this be added to the directions, for clarity? I would also love for this to be added to the directions. I made a batch of CP soap that was scented lighter than I would like after cure even though I used the “medium” rate. Then I realized I only used my oil weight in the calculation! Fragrance and essential oils are considered an additive, so they are added to the total weight of your recipe, include oils, lye and liquid. Sorry for any confusion, and thanks for your suggestion! I realize that there are differences between people, concerning how much fragrance is “just right”, but is there a way that you could adjust your calculator to accommodate the strengths of different fragrances? Since you know that English Rose comes on strong, could you factor that into your calculator so I wouldn’t have to find out through trial and error that I don’t need to add very much of it? Frequently, I’ve seen reviews of fragrances that they are faint after soaping, to which there is a reply that “you can add more next time” … which is absolutely correct, but it doesn’t fix the problem that I just made a beautiful batch of basically unfragranced soap. Could hints about fragrance strengths be added to the “Notes” section, so this would show up in the fragrance calculator results page? Then I could see that, for the particular fragrance I’ve selected, I need to tend toward the heavy side or the light side. I agree Elizabeth! This is why I rely on reviews so much because I have run into issues with fragrance oils. I love the calculator, but it is nice to have the human element as well. However, even that is problematic as I recently learned with the Woodland Elves oil. 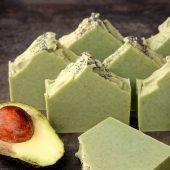 Reviewers commented on it being strong, and the calculator recommended a much smaller amount (even the strongest recommended amount) that I usually would use in soap, but for me the woodland elves turned out to be a lightweight in my soap and has almost disappeared. Realistically, I don’t know if there is a solution to this issue (or these issues), so I try to read all the reviews as well as contribute my own. There is great community spirit in the reviews! I always test out new FOs before making them into a full batch. It’s a bit of a challenge, but I can determine how a FO or EO will perform for me in general. I get a bunch of 5-oz Dixie cups and label popsicle sticks with the name of each FO/EO to be tested. 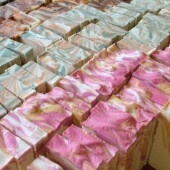 I make a batch of Lots of Lather soap that’s sized to make a 4-oz sample cup for each FO/EO. Soon before I mix up the soap, I measure out around 5 ml or 5 g of each FO/EO into separate cups and place the labeled stick on top of the cup. 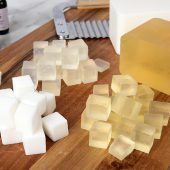 Mix up the batch, pour 4 oz soap into the fragranced cup, stir the soap well into the FO/EO with the popsicle stick, then proceed to the next cup. I learned that it’s best to leave the stick standing upright in the middle of the cup … then, when the soap is ready to “field test”, it’s a soap on a stick! And pretty fun to use in the shower. This method gives you a real comparison between different FOs, so you can determine if an FO is a strong one, or a fader that requires extra dosage. You can also compare the discoloration, since the LOL recipe makes a lovely ivory colored soap on its own. However, it’s hard to really test for accelerated trace, since you’re dealing with such a small sample. The best way to ensure a true comparison between FOs is to weigh everything precisely. I just got a nice scale that can handle 0.1g, so it helps me with my soapy experimentation! 🙂 But a graduated pipette like BB offers is a good way to measure a controlled amount of FO for comparison. As they say: Happy Soaping!